What Are Vendors Thinking About The Corrupt FDA Actions? I have to admit, my first thoughts when I read a synopsis on the corrupt FDA and their deeming regulations a couple weeks back was how aghast I was that this corrupt FDA would move in such a disastrous fashion. After writing a few commentaries about the upcoming “deeming regulations” I had written about the loss of tens of thousands of jobs, thousands of businesses in the US alone, and the ripple effect throughout the US economy. I just couldn’t believe that this 8-year-old weak economy could be made deliberately worse by the federal government. Never mind the safety issue, which I will get to, the sheer economic wrecking ball of overly harsh regulations would cost the country billions over just the next few years. No economist would ever advise the President of the United States to move in such a malicious way, yet that is just what the Food and Drug Administration did. You can’t decide the science on anecdotal stories from individuals, but they can certainly guide government officials on such important matters. In any case, after I stopped smoking in 1992 I began vaping a year before we launched Spinfuel. I did so because I watched my brother, a very heavy, 3-pack a day smoker, leave tobacco product cigarettes after just a day with, are you ready, a Blu Cigs battery and a few prefilled cartomizers. I’d never even seen an electronic cigarette until I visited him. I was stuck by how close it looked to smoking, how much he enjoyed it, and how in such a short period of time he tosses his 35 year, 3-pack a day Marlboro habit and never looked back. When I returned home I began looking up everything I could about this miracle cure for smoking tobacco. And, because I had always missed that act of inhaling and exhaling smoke (so calming) I ordered a starter kit for myself, and a 5-pack of all the flavors from Blu Cigs. All I could think about after my starter kit arrived was so incredibly enjoyable it was to “vape”. Shortly after digesting thousands of words written about the devices, the e-liquid, and Johnson Creek, the only company supplying eliquid to Blu Cigs for their cartomizers, I could not understand why this miracle wasn’t being shouted from the rooftops of every anti-smoking group, doctors, scientists, and politicians. Finally, a fun, delicious, and relatively cheap, (compared to 3 packs of Marlboro at $6.50 a pack!) way to put the final coffin nail in the tobacco industry had arrived, where was this huge victory for all those that are against smoking tobacco products? Five years later and the industry looks nothing like it did back in the Blu Cigs days. 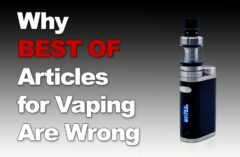 Box Mods and Atomizers are 100 times safer than they were, most people have moved away from ‘Homebrew” e-liquids, and homemade mech mods and RDAs, and nearly every eliquid vendor now uses premium grade ingredients, safety caps and/or shrink-wrap, and we know 1000 times more about the safety of vaping now than we did 5 years ago. So, is vaping safe? At one time I declared vaping to be completely safe, 100%. I still believe that. One personal indicator from myself is that 6 years ago my “sat-rate”, or saturation of oxygen in my blood was 95%. I have this test done every two years, the last time I had it done, in late 2015, my sat-rate was 96%. After 5 years of vaping, beginning with Blu Cigs and moving up to high wattage, low resistance vaping for the past 3 years, at a rate that most would call “pacify vaping”, i.e., I am always vaping, the oxygen level in my blood is better now than it was before. How do you explain that? In addition, over the past 5 years I’ve not suffered a single Cold, not the flu, not anything. Which is funny because I used to catch colds quite easily before I started vaping. So again, with millions of anecdotal stories from people all over the globe, it has been determined that vaping does no harm, yet tobacco products kills 443,000 people a year in the US alone die from smoking. NO ONE dies from vaping. Just try to get the corrupt FDA to accept that. 95% – Is that better? Anyway, since I heard it bandied about so often, I’ll back off publically stating that vaping is 100% safe, and go with what most doctors and scientists have decided through various studies, Vaping is 95% safer than smoking tobacco products. That means that if all smokers turned to vaping, we would save 420,850 lives in the US every year. 95% safer than smoking tobacco, yet the corrupt FDA has ‘deemed’ vaping not only to BE a tobacco product, but to be a dangerous one. My God, the influence of money corrupts so many people in positions of power that our Founding Fathers are probably spinning in the graves. The United States Federal Government is so corrupt now that I do not believe we will ever see a clean federal government again. Not ever. So, what are vendors thinking about all this? What did they think when the FDA announcement was made, and did that thinking change once the shock wore off. Do they believe their company can survive, or that Vaping can survive as a successful alternative to tobacco products? I put these three questions to three vendors, one in e-liquid, one in China manufacturing, and one Vape Shop owner, a good cross section to hear from. . Question 1 – What was your original reaction last week when you first heard about the FDA announcement? Question 2 – In the days after, has your reaction to the announcement changed, in what way did it change? Wendy – Yes, somewhat. As a member of NATO, I was able to get a summary of those 499 pages. It was much easier to read. I am tossed between wanting some regulations and the extent to which the FDA as formulated these regulations. Question 3 – Are you confident your business can survive the upcoming changes, and if you do not believe your business can survive, have you begun to make contingency plans? Wendy – My business will survive after the changes. I am confident that my manufacturers will be able to pass all the deeming regulations and with that my competition will decrease. Most small vape shops that are making their own ejuice will disappear. The large manufacturers I deal with are already on board and will allow my small vape shop to survive. I have been planning for these regulations for more than 5 years. I was one of the buyers who had ecigs confiscated by the FDA years ago. With the Sotera Case, it was clear there would be regulations. I believe the FDA has made it very difficult for the small guys. 330,000 dollars is not a lot of money for the bigger and better manufacturers to make good. On the other hand, it appears that the FDA will be approving Kits, and no substitution will be allowed without their consent. I also thought the 3-year play on some of this will help. I am partially for and partially against the regulations. I guess because of my issue with the improper manufacturing of the ejuice. I for one do not want to see anyone die or get sick from unsterile making of ejuice. With that said, I do think that the regulations will help the big boys and kill small businesses. I also blame the industry for this, as since 2007 no one really took on full testing of the effects of vaping. The FDA makes some wild claims and without substantial testing to support the industry side, we lose. And one more point John. I have been selling ecigarettes for 9 years. I have sold pre 2007 kits. I have watched this industry grow exponentially. The number of young people vaping has exploded. The FDA is correct in their assessment of teenagers latching onto the ecig explosion. Parents are buying 14 year olds ecigs. Maybe because they don’t want them smoking real cigs or maybe they already are and need to quit, but whatever the reason, the industry did nothing to show justification of why the younger generation has interest in ecigarettes. 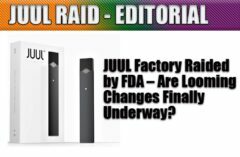 The regulations probably will not change this, only make it harder to find vaping equipment and juice. The last point I want to make, is that this is all about money. The next step is taxes on ejuice and vaping kits. That will increase the price tenfold. In Florida the taxes on OTP are 85%. I think the Vaping industry is about to go underground. People will buy from China directly. Next up is Sean Davis, the owner of Atom Vapes, a Chinese manufacturing company, maker of gClapton and gCeramic coil heads for many of the top sub-ohm tanks, and the maker of such cool mods, like the recently reviewed Yakuza, the first mod to use Apple’s Thunderbolt technology. I asked Sean the same 3 questions. Sean – We were really surprised by the FDA regulations; we did not know they would be this detrimental to the industry. I know that there were some regulations that were previously proposed by the FDA, but we considered that due to the out lash from the vaping community, they would have made amendments and perhaps provided something similar to the TPD in Europe and England. To put us into the same category as Tobacco products, is not only detrimental to the economy, but detrimental to overall public health. I am hoping there is something we can still do to challenge the current structure of the regulations within the 90-day time-period. If they get passed in their current form, it is not going to be good for this industry. The cost mentioned of getting products approved currently stands at 1700 hours and a price-tag of $1M. So to get one liquid flavor with three different strengths of nicotine would be a $3M price tag. This is absolutely ridiculous, all this does is hand over the entire industry to Big Tobacco, who has the cash flow and resources necessary to get products approved. I know of not a single manufacturer here in China who will be able to survive, regardless of their revenue. There are not enough profits to be earned from each product launch to justify the cost of getting the product approved. We cannot think of any workaround with the way things have currently been proposed. Sean – We have been having a lot more conversations regarding the future of our company and the future of the industry as a whole. We have been reaching out to our customers to speak to them about their comments and concerns. We have been trying to get an idea of the timeline that is involved in all of this. For example, if the regulations are passed as is, does this mean that in three months the entire market will freeze? Will companies be able to launch new products after the three months and then have the ability to comply within two years or is there no new products after three months? I have read a lot of information on this and currently nothing seems concrete, there is a lot of wording within the FDA document that is not very decisive or descriptive. There is no way to find out the meaning of some of the things that have been mentioned in the 500 or so page document put forth by the FDA. The way we look at it, how do they define an e-cigarette? If you break down the components of an e-cigarette, it’s a PCB board, some metal housing, liquid, wiring and glass. So from a material standpoint could you technically just sell these things individually and have people assemble it themselves? What type of regulations are there for heating elements? or PCB boards or copper tubing? I think we can go around some of these regulations simply by breaking down the components into separate parts and selling them individually. I think that e-liquid manufacturers could possibly do the same thing by breaking down the ingredients of the juice and have users mix it themselves. Obviously there would be a higher cost involved but I think that the industry could function as a whole. Although we are not going to experience the growth that we have experienced in the past few years, this will really slow things down. But we could keep the current e-cig users from switching back to tobacco cigarettes. This will also shift the industry to more DIY products. Especially with the rising capabilities and falling prices of 3d printers, a lot more people are going to start making their own products. Now, I don’t exactly know how safe this will be, people might switch back to RDA’s and mechanical mods that they have made themselves. Although this is not an issue for advanced users, it does pose a slight risk for new users who may try their hand at it, without fully understanding the risks involved, or fully understanding how the entire mechanism works. So instead of having safe products on the shelves of convenient vape stores, the FDA would rather have us run around and try to make the products ourselves. Usually a vape shop could provide you with instructions on how to use RDA’s and mechanical mods, but due to the regulations that channel of information would no longer exist. Sean – In the short term, yes, our business can survive. We are an international organization with customers all over the world. This would hurt our revenues but we would be able to make it. However, when you look at this from a long view point then you realize that this will not only hurt America, this decision will influence the entire world. If this industry gets squashed in America, several other countries with follow suit. The innovation, energy and passion that has risen from the USA has not been replicated anywhere else in the world. You could say America is the heart of vaping, and if you remove the heart, everything else follows. 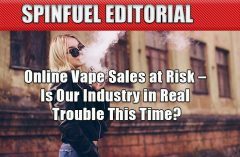 There are only two options here, with the ban and restrictions of vaping products in America the influence of tobacco companies and cigarettes will flourish, getting people back to smoking tobacco cigarettes. The second option is that the tobacco industry will now innovate e-cigarettes and come out with new products as they are the only ones who can afford such a price tag on getting products approved. But from the tobacco companies standpoint, it would be better to just not innovate at all and let the industry slowly collapse upon itself, it is more difficult to innovate and probably a lot less profitable compared to their current best selling product which is cigarettes. The amount of time it would take them to setup their supply chain, costs of tooling and molding, logistics, labor, and other manufacturing issues that are bound to arise would put provide a challenge for their current setup. They could overcome the challenges but it would require effort that would otherwise not be required if they let the industry just collapse, and sweep it under the rug. Smoque Vapours – It was a gut-shot. I was actually on a plane when the announcement came out and there were about 50 texts and emails along with my company manager Facebook messenger chat lit up by my team upon landing. I read what I could while taxiing and it was a long walk to baggage claim. Each of us just wondering what we are going to do with our lives now that big tobacco and Big Gov taxation won out over harm reduction and common sense. Smoque Vapours – We still have a shot at this if HR 2058 gets passed. Beyond that I believe we all understand the consequences if it doesn’t. So, we have gone through our stages of denying, anger, frustration, and resignation that we are done without a successful Hail Mary. Smoque Vapours – There is no survival. Not for anyone except Big Tobacco. The regulations as written are equivalent to “….global thermonuclear war.” Game over for everyone. Cleary, China manufacturers will have more survival time than anyone in the United States will. Is Sean right about the rest of the world following the US? I’m not so sure. The US made a big mistake with vaping, and while the EU’s regulations are not that much better, at least they understand that vaping is safer than smoking, something our corrupt FDA officials are forced to disbelieve because of the money they are being paid to kill the industry. Perhaps other countries will follow the UK this time, or by the time all this implementation takes root, 2 or 3 years down the road, things will change dramatically, in our favor. China will do what’s best for China, and if they can’t enter the US market without paying the extortion, they should concentrate on other, more favorable countries. I do like Sean’s idea about selling kits that the user assembles, and if that does turn out to be a valid loophole, I think it should be explored. Wendy knows the US vaping industry more than anyone else I know. Hell, she told me 5 years ago that this was all coming, just as she says above. Maybe she is prepared for it, but are her customers? Will people pay 10 times the current amount of eliquid or a vape pen? I doubt it. I myself am not certain I wouldn’t act out of spite and go underground. Finally, there is the e-liquid company, Smoque Vapours. They make extraordinary eliquids, but they don’t seem at all confident in the outcome of all this. Like many spokesmen in our industry, the only thing that can save us is the two bills currently in Congress. If they pass, things will be very different. We’ll wait and see. One thing is for sure, as Jim says, without an act of congress, we will all lose, and lose big. By mid-2018 what could have been the most powerful tool against tobacco products will die. For further reading, I strongly suggest you read about Prohibition in our own country. For a 13-year period any type of alcohol was illegal to sell, and illegal to consume. Why? Because the very same “type” of politicians that were in power back then are in power now. Regulating against things American citizens wants creates an underground economy. We’re Americans, and we don’t take it lightly when the government overreaches. People that refuse to remember the past are doomed to repeat it.